Poveglia (Italian pronunciation: [poˈveʎʎa]) is a small island located between Venice and Lido in the Venetian Lagoon, northern Italy. A small canal divides the island into two separate parts. The island first appears in the historical record in 421, was populated until the residents fled warfare in 1379. Beginning in 1776, the island was used as a quarantine station for those suffering the plague and other diseases for more than 100 years, and later as a mental hospital. Because of this, the island is frequently featured on paranormal shows. The mental hospital closed in 1968, and the island has been vacant since. The island is first mentioned in chronicles of 421, when people from Padua and Este fled there to escape the barbarian invasions. In the 9th century the island's population began to grow, and in the following centuries its importance grew steadily, until it was governed by a dedicated Podestà. In 1379 Venice came under attack from the Genoan fleet; the people of Poveglia were moved to the Giudecca. The island remained uninhabited in the subsequent centuries; in 1527 the doge offered the island to the Camaldolese monks, who refused the offer. From 1645 on, the Venetian government built five octagonal forts to protect and control the entrances to the lagoon. The Poveglia octagon is one of four that still survive. In 1776 the island came under the jurisdiction of the Magistrato alla Sanità (Public Health Office), and became a check point for all goods and people coming to and going from Venice by ship. In 1793, there were several cases of the plague on two ships, and consequently the island was transformed into a temporary confinement station for the ill (lazaretto); this role became permanent in 1805, under the rule of Napoleon Bonaparte, who also had the old church of San Vitale destroyed; the old bell-tower was converted into a lighthouse. The lazaretto was closed in 1814. In the 20th century the island was again used as a quarantine station, but in 1922 the existing buildings were converted into an asylum for the mentally ill and for long-term care. After 1968, when the hospital was closed, the island was briefly used for agriculture and then completely abandoned. In 2014 the Italian state auctioned a 99-year lease of Poveglia, which would remain state property, to raise revenue, hoping that the buyer would redevelop the hospital into a luxury hotel. The highest bid was from Italian businessman Luigi Brugnaro but the lease did not proceed as his project was judged not to meet all the conditions. The surviving buildings on the island consist of a cavana, a church, a hospital, an asylum, a bell-tower and housing and administrative buildings for the staff. The bell-tower is the most visible structure on the island, and dates back to the 12th century. It belonged to the church of San Vitale, which was demolished in 1806. The tower was re-used as a lighthouse. The existence of an asylum on Poveglia seems to be confirmed by a sign for "Reparto Psichiatria" (Psychiatric Department) still visible among the derelict buildings, as photographed by Ransom Riggs in his May 2010 photo-essay documenting his visit to Poveglia. However, there seems to be no evidence of an alleged prison. A bridge connects the island on which the buildings stand with the island that was given over to trees and fields. The octagonal fort is on a third, separate island, next to the island with the buildings, but unconnected to it. The fort itself today consists solely of an earthen rampart faced on the outside with brick. The island contains one or more plague pits. Some estimates[by whom?] suggest that 100,000 people died on the island over the centuries. Some time after the island had become a quarantine station for ships arriving at Venice in the 18th century, a plague was discovered on two ships. The island was sealed off and used to host people with infectious diseases, leading to legends of terminally ill Venetians waiting to die before their ghosts returned to haunt the island. In 1922, the island became home to a mental hospital where a doctor allegedly experimented on patients with crude lobotomies. He later threw himself from the hospital tower after claiming he had been driven mad by ghosts. The island has been featured on the paranormal shows Ghost Adventures and Scariest Places on Earth. The island also featured in the Alex Rider series by Anthony Horowitz as "Malagosto", the main assassin training centre for SCORPIA. A dark Polish graphic novel by Roman Pietraszko (art) and Maciej Kur (script) titled "Żyjesz?" ("Are you alive?") is set on the island of Poveglia during the Plague and focuses on a sick girl and a boy trying to escape from the island while being hunted down by the plague doctors. An island inspired by Poveglia is the main location in the Sandman graphic novel Endless Nights, in the first story Death and Venice. The island is owned in the 18th century by a rich nobleman and alchemist, who finds a way to shield his palazzo, himself, and his guests from the ravages of time to repeat the same day over and over. The narrator visits the island as a boy and later as an adult, where (like Poveglia) it has been long since abandoned with a reputation of being haunted. Is the title of book #4 in the "After The Cure" series of post-apocalyptic novels by Deirdre K. Gould. Like the 3 preceding books in the series, the novel "Poveglia" is set in a world ravaged by a quasi-zombie plague of "The Infected" and takes place 8 years after the initial outbreak, by which time a cure has been developed and administered so that most of the formerly Infected and those who were Immune are now coexisting in what may be the only remaining civilized city. Linda Medley's graphic novel Castle Waiting refers to Poveglia as 'The Island of No Return'. The character Dr. Fell was driven mad attempting to treat the plague victims there. ^ a b c Kington, Tom (15 April 2014). "'World's most haunted island' up for auction". The Telegraph. Retrieved 16 September 2014. ^ "How much? 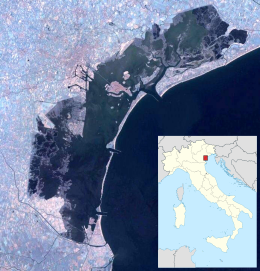 Haunted island near Venice Lido sells for €513,000". The Guardian. Agence France-Presse. 13 May 2014. Retrieved 23 May 2017. ^ Sironi, Francesca (11 June 2014). "Poveglia, l'isolotto gioiello della laguna non sarà svenduto". L'Espresso (in Italian). Rome: GEDI Gruppo Editoriale. Retrieved 23 May 2017. ^ "Strange Geographies: The Happy, Haunted Island of Poveglia". Mental Floss. ^ "Żyjesz?". gildia.pl (in Polish). Wikimedia Commons has media related to Poveglia.